Situated at a distance of 31km from Hassan district in Karnataka, Halebid (Halebidu) earlier known as Dwarasamudra was the ancient and wealthy capital city of the Hoysala Empire during the 12th and 13th centuries AD. 'Halebid' literally means ruined city, now consists of only some well crafted temples amid a lush landscape. 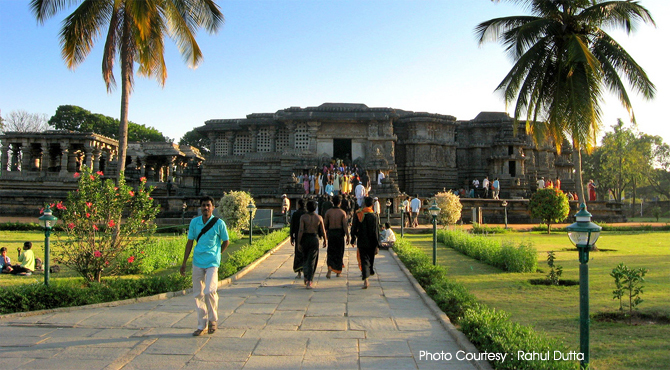 It is home to one of the best examples of Hoysala architecture, the Hoysaleswara and Kedareswara temples. Also known as the Benaras of the South, Halebid is situated alongside a large 9th-century artificial lake known as Dvarasamudra which means entrance from ocean. The city was destroyed by the armies of the Delhi Sultan Allaudin Khalji in 1311 and 1327, after which it was deserted and later renamed Halebid. Fortunately, the Hoysaleshwara temple survived . The Hoysalas then shifted their capital to Belur, leaving behind Halebid. The walls of the Halebid enclose an approximate half circle almost 4 km across. The granite walls have gateways with bent entrances interspersed with square bastions. The Hoysaleswara temple complex comprises two Hindu temples, the Hoysaleshawara and Shantaleswara temples and two Jain Bastis. Each shrine consists of a central sanctuary with three subsidiary chambers. The Jain bastis located within a garden enclosure have gleaming blackstone pillars and carved ceilings. One of the largest Shiva temple of South India, Hoysaleswara temple is a remarkable double shrined temple, constructed in 12th century during the reign of King Vishnuvardhana Hoysaleswara was named after this king. The largest of the Hoysala temples, this temple fell to enemy attacks even before it was completed. It is one of the finest examples of temple architecture in India. Like the monument at Belur, Grey green schist was used for the construction of Hoysaleswara Temple. The temple complex is on a platform abd there are two shrines. Each shrine has a linga (a symbol of Lord Shiva). The shrines have images of Hoysaleswara, named after the king and Santaleswara, which is named after Queen Santala Devi, the wife of King Vishnuvardhana Hoysala. A monolithic Nandi bull statue is placed in front of the Hoysaleswara temple. The temple complex faces a large water tank which was believed to be built in the middle of 11th century. The walls of the temple are covered with detailed friezes and sculptures depicting scenes narrated in Hindu epics. The speciality of this temple is that no two sculptures of the temple are the same. The various sculpture inside the temple like Krishna lifting mount Govardhana, Bhishma dying on a bed of Arrows, Krishna with gopis, Rama defeating the demon God Ravana. Rama killing the golden deer, Rama and Sita with the monkeys etc shows the excellence of the artisans' craft. The temple remain open from sunrise to sunset. The Shantaleswara Temple at Halebid is also a worth visit. It was built by Veerballala II and his queen Abhinava Ketala Devi, in 1219 AD. An open air Archaeological Museum located on the temple premises displays 12th-13th Century sculptures, wood carvings idols, coins and inscriptions. There is a large image of seated Ganesa and a Nandi. It is opened on all days from 10am to 5pm except Fridays. A road running about 1km south leads to the group of the 12th century Jain bastics. With lathe-turned bastis stand in a garden enclosure, one can walk around and see the dark interiors with carved ceilings.